Win A Holiday To Cuba! Drive A Classic Car! Win A Holiday To Cuba! Drive A Classic Car! Enter For Free Now. Get �5 Free To Play When You Sign-Up! Get �5 Free To Play When You Sign-Up! Get Started.. Refer a Friend and BOTH Receive �5 Worth of Supercar Tickets!! Become a Supercharged Club Member & Enjoy Additional Exclusive Offers!! Become a Supercharged Club Member & Enjoy Additional Exclusive Offers!! More Welcome to the Best of the Best Supercharged Club � our way of saying thank you to our most loyal and valued customers. Supercharged Club Members enjoy exclusive benefits � full details are provided below. We hope you like the Supercharged Club but we know we can always do better. Do let us know your thoughts � good and bad � by emailing info@botb.com. Thank you for your continued support. How do i become a member? To become a Supercharged Club Member, you must have entered at least six of our Dream Car Competitions in the past twelve months. We'll send you an email to let you know that you've qualified and you'll be invited to start taking advantage of the special benefits that Club membership brings. Continue to play at least once every three months to retain your membership status. Buy Any 10 Tickets (For Any Car) And Get 40% Off All Your Tickets. Buy Any 10 Tickets (For Any Car) And Get 40% Off All Your Tickets. So Book Now. No Coupon Needed. Buy Any 5 Tickets (For Any Car) & Get 20% Off All Your Tickets. Buy Any 5 Tickets (For Any Car) & Get 20% Off All Your Tickets. So Book Now. ONLY 10 DAYS TO GO! Not sure which cars to play for in the latest competition? Find out more about BMW's impressive X5 update, drool over the ever popular Aston Martin DB9 and see how Porsche have joined the Hybrid party below. Don't miss out, you could be the next big winner! Welcome to botb.com, where we give people the chance to win the car of their dreams. 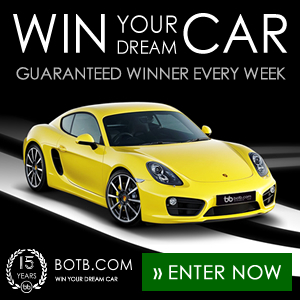 Every two weeks someone is guaranteed to win their Dream Car. In the past 14 years there have been hundreds of winners, taking home over �14 million worth of prizes.